Surprise! As a US blogger and dad publicly shared the “a-ha!” moment when he realised he was simply doing rather than helping when completing chores around the family home, women wondered loudly if this signals the tide is turning on inequality and domestic life. 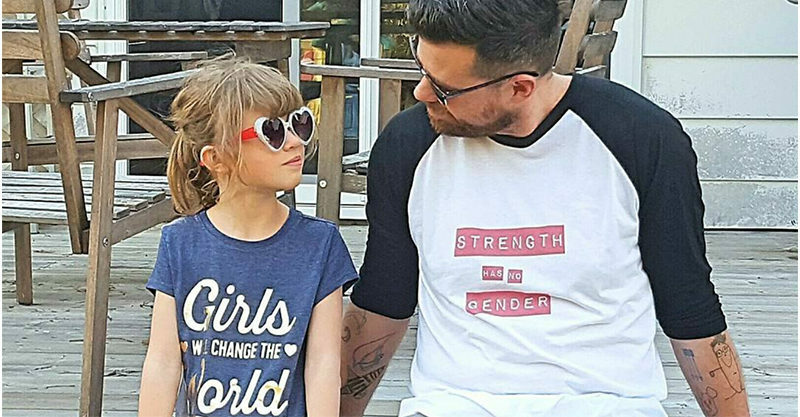 The gent in question is Mike Reynolds, who blogs at Everyday Girl Dad, and is the father of two daughters, 5-year-old Charlotte and 7-year-old Leah. Mike shared his moment of clarity via his Facebook page – and many women cheered loudly as it looks like some dudes are finally starting to understand the load that many women carry. Mike was making school lunches, trying to give his wife Andrea a break (his words). It dawned on him – after reading the great comic strip You Should’ve Asked which magically distilled many women’s experience of family life into one easy-to-understand illustration – that he was not giving his wife a break at all! Rather, he was just doing domestic work that needed to be done. It shouldn’t be seen as virtuous, but rather routine and commonplace. “Making lunches, washing dishes, sweeping up dirt, folding laundry, picking up LEGO, signing tests, writing book order cheques, remembering it’s hot lunch day, getting money for popcorn day, feeding the cat, cleaning the kitty litter isn’t ‘helping out,’ it’s ‘equitably splitting labour.’ If you find yourself thinking this way, fix it right away. Don’t let it linger,” Mike posted. Fix it right way. Yes! We love it that the penny has dropped for Mike when it comes to equality. Ace work, sir. We do wonder, however, why it’s taking Emma’s amazing comic strip to make the issue of domestic inequality truly hit home for many gents. Why don’t ‘helping-out’ type men hear this message when it comes from their own beloved wife or domestic partner’s mouth? (The already thoughtful and supportive) Mike’s further rethinking the whole thing now, telling Huffington Post it’s high time we listened more carefully to women’s experience of relationships and family life. It’s what many women have been saying all along. We predict some commenters on this post may remark “my husband helps around the house, this isn’t true for me” but that very statement illustrates that men are seen as “helpers” rather than being expected to carry an equal, adult role, managing and running the household and caring for kids. In stay-at-home-mother families, mums spent 37 hours per week on child care. And the same amount of time (37 hours) on housework. In stay-at-home-father families, dads spent 19 hours on child care, and 28 hours on housework. The domestic – and emotional – load in relationships still falls chiefly on women’s shoulders. This needs to change, quick smart. For things to change, it seems clear that men have to learn to feel that their home is also their responsibility. For a start, it would be good if fathers insisted on their right to be with their family in the first month of their child’s life. Right now only feminists are demanding longer paternity leave, and without much success. It’s time to take the lead. Have you got a “helper” at your house?